I found the theme of “happy” very difficult. I was thinking about the design for my niece’s wedding quilt and began wondering about weddings in the Far East as she was married in Thailand. Research found me the Chinese double happiness symbol. This is actually two words for happiness, hence double happiness. Whenever Chinese people see this symbol, they think of a wedding. They think of two persons getting married and also think of the two families sharing the happiness of the wedding. 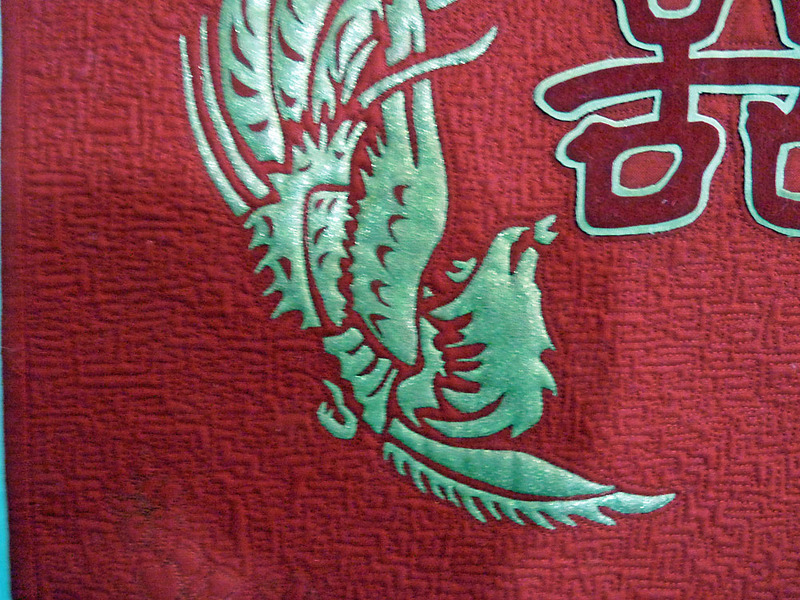 It is also not uncommon for a phoenix and a dragon to be linked to the double happiness word. The legendary phoenix rising from ashes to create a new life is the yin of the yang found in the dragon symbol. When you use the two together, you draw the energies of yin and yang in an effort to create the perfect balance, which in turn will bring great happiness. Red is the traditional colour used for a wedding invitation. So I thought I’d try and recreate a quilted wedding invitation. 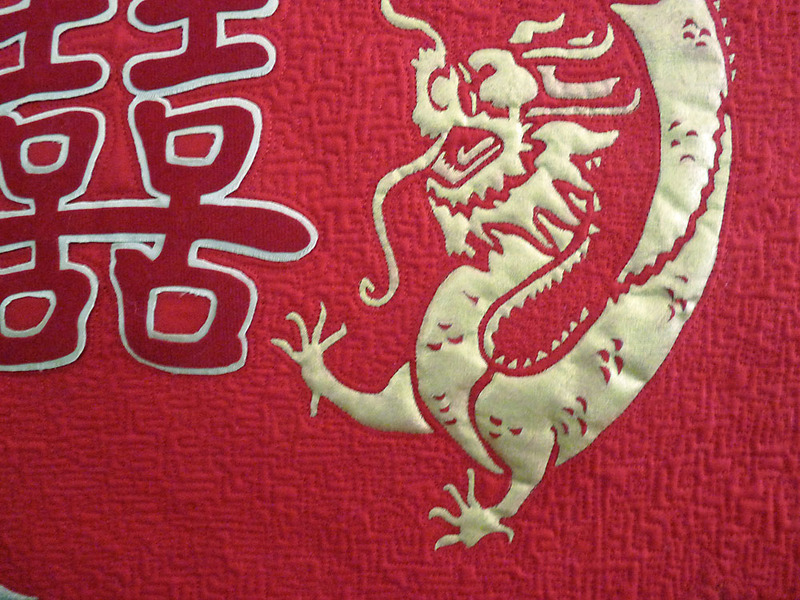 The dragon and phoenix are fabric painted onto red cotton chintz. 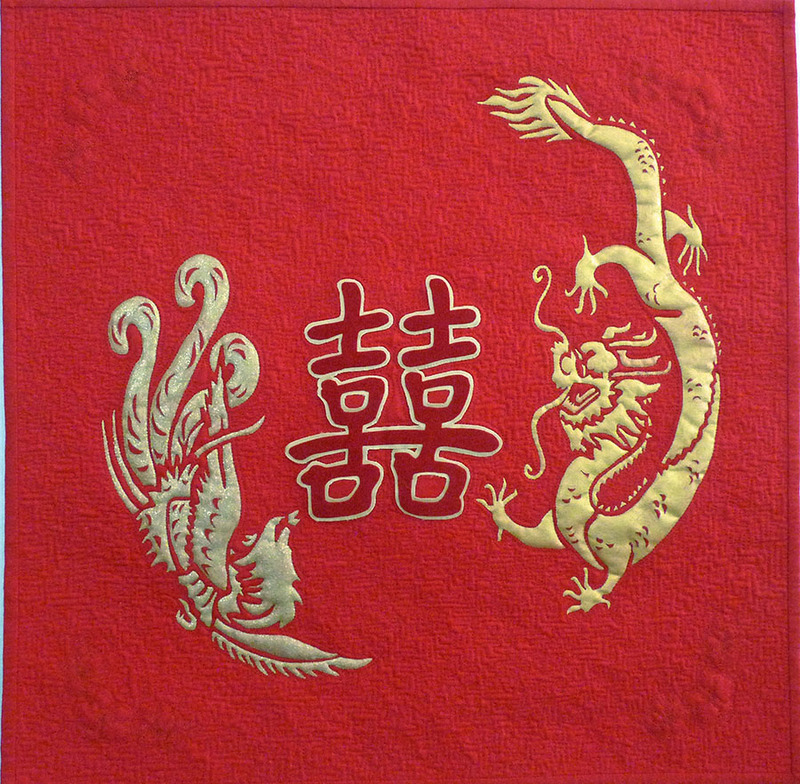 The Double Happiness word is made up of a shiny gold fabric and a red artificial suede which has been fused into the centre. I have also added a trio of two lilies and an orchid in each corner as these are common flowers that appear in the wedding bouquet.The design elements have all been free-motion outlined in fine silk. Silk has also been used for the micro background fill. It is a little bright but overall I’m pleased with the result. The story of the Double Happiness sign originated from a student’s journey during the Tang Dynasty. According to the story, the boy who was about to take a final examination fell sick on his way to the capital city. Luckily, an herbalist doctor and his daughter helped him. However, the girl did not just make him feel better, she also made him fall in love with her. Because the girl was in love with the boy, she wanted to make sure if the boy was her perfect match. And so, before the boy left for the capital city, the girl wrote a part of a rhyming couplet on paper, with the hopes that the boy can find its perfect match. At the examination proper, the boy was able to bag the first place. When the emperor came to assess the boy’s skill, he asked him to finish a couplet. Fortunately, the part of the couplet that the emperor gave the boy was the missing match to his love’s rhyme. The boy recited the part of the couplet that the girl wrote for him. Pleased with the young man’s answer, the emperor made the boy one of his Ministers. Before taking his post, the boy went back to the girl and recited her couplet’s match. They then got happily married. During their traditional Chinese wedding, the couple wrote the character “XI” twice on a red piece of paper. They posted it on the wall and since then, that double “XI” became the Double Happiness symbol, symbolizing the “doubled” happiness that the couple felt because of their union. What a unique interpretation…and so beautifully and skillfully rendered! Lovely! Beautiful work and the research is interesting as well. I love the red and gold theme. I enjoyed reading the background information—it gives the work so much more meaning. You did a lot of research. Beautiful quilting.